Often you see bloggers publish sponsored posts on their blog. Recently one of our users asked if it was possible to automatically add a “Sponsored” prefix in post titles. 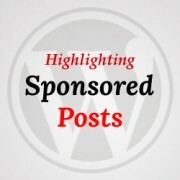 In this article, we will show you how to add sponsored post prefix to post title in WordPress. Custom fields allow you to add meta information to your posts. 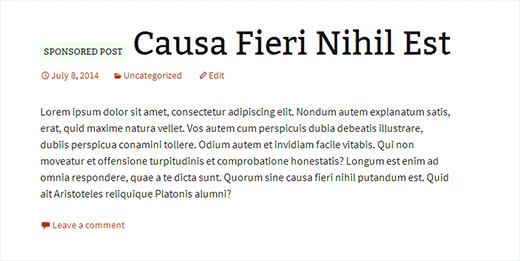 In this article we will be using custom fields to add sponsored meta field to a post. First you need to create a new post or edit an existing one. In the post editor, scroll down to the custom fields metabox. If you can not see the custom fields meta box in your post edit area, then you need to click on the Screen Options button on the top right corner of the screen. This will open a menu where you need to check the box next to custom fields options. Now scroll down to the custom fields meta box and add sponsored in the custom field Name, and true in the value field. Next you need to save your post and scroll down to custom fields meta box. You will notice that custom field meta box is now showing a drop down menu. Next time you need to set a sponsored post, all you need to do is select sponsored from the drop down menu and enter true in the value field. After adding the sponsored custom field to your post, you need to copy and paste this code snippet into your theme’s functions.php file or a site-specific plugin. That’s all. Try visiting the post you edited earlier, and you will see Sponsored Post: prefix with the post title. If you study the code snippet, you will notice that we have wrapped sponsored post text around a CSS class. Using this CSS class you can highlight the text inside the post title. Here is a little CSS that you can add to your theme or child theme‘s stylesheet. Feel free to modify the CSS to meet your needs. If you study the code we have made just two changes. We have added a single letter space before the sponsored text, and then we have switched the order to display $title first. That’s all, we hope this article helped you add a sponsored post prefix / suffix to post title in WordPress. I’ve done it,that’s Ok.But,Title post is appear in home page without sponsored text. How can I make it appear in Home page ? Is there a way to add an image in place of the text, please? Hi, I’m new to WordPress and talking about pasting codes to function.php file almost made me loose my site. please where exactly can I post this code on the function.php folder? I have zero knowledge of codes. Please take a look at our guide on pasting snippets from web into WordPress. I have created a custom meta feild for my custom post type which is a check box. So can u please tell how to display posts by checking whether that checkbox is checked or not? Hi, does “sponsored post” is also shown in the RSS feed? Thanks for the great tip! Will filtering on the_title() also be reflected in the RSS feeds for sponsored posts or just on the blog posts on the site? Great article. Works like a charm. But I cannot seem to make the custom field be saved so I can pick it from the dropdown box for a next post.